In addition to going through some stressful times and psychological blah this week, this one was just kind of difficult, with the suit of armor and trying to figure out how to portray what’s going on… I hope it’s not totally confusing. Thank you all for being supportive and understanding when life and drawing aren’t so easy. Gotta love Derk’s expression in the last panel. Captcha says “this redscli” today. <3 Derk. We've all missed him, I think! So that’s what he’s been up to… Food! 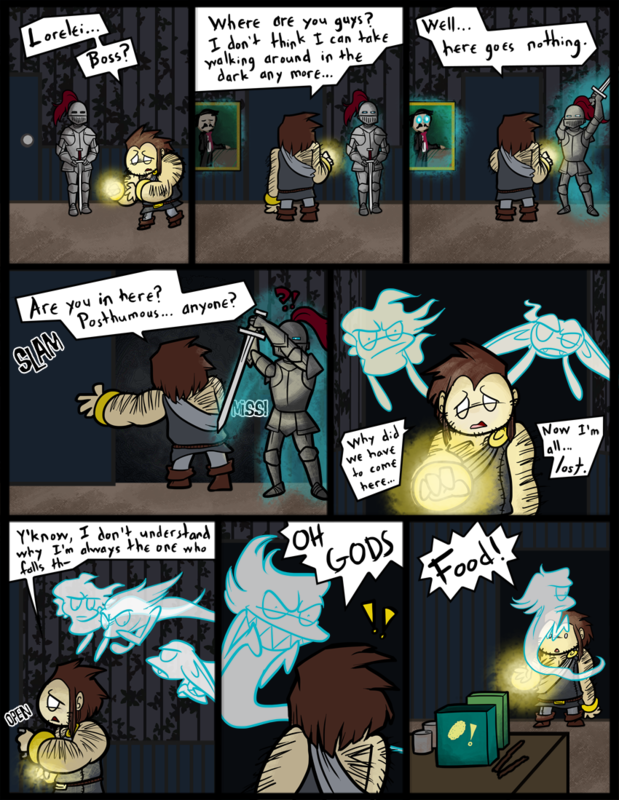 Oh, and I really like the ghost’s face in the 7th panel, It’s so awesome! Derk is usually up to food if he can help it. Doors say open all the time. Are the ghosts attacking him because he is using Light magic, or because they are just jerks? When one is hungry, there is no time to be scared. ..Jus’ y’know, putting that out there. I need to throw in a flish ghost… I don’t see why they wouldn’t exist. Your avatar makes it look like Derk is chiding himself. With all the ghosts around Skarva’s keep, would Derk be afraid of ghosts? The ghosts at home actually respect Derk, and so they don’t typically scare him – he is their boss, after all. They mostly save their talents for when Blank comes around, or anyone else needs to be scared off. The ghosts in Mire Manor are more independent; they outright reject any authority, like Posthumous, and just basically scare and prank people whenever they get the chance. Most ghosts in Idenau are like this, and it makes Mire Manor and Cattail Crossing very popular ghost hangout spots. The ghosts in this house don’t respect Derk, and he knows it, so he is genuinely afraid of them. However, food distracts him enough to forget his fear. I’d have to say this is one my my fav parts of the comic. …why would food be in a house of undead? Bet you its rancid! Could be worse. It could be preserved in brine or something.